The American Medical Association officially recognizes and classifies obesity as a disease. This move has caused physicians to pay more attention to the condition and push insurers to pay for treatments. Obesity is different from simply being overweight. For people struggling with obesity, weight control is nearly impossible. Obesity is a dangerous disease because it puts you at risk for numerous medical conditions, some of which could be fatal. 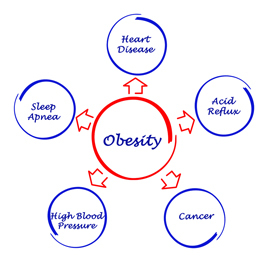 Obesity can also severely impact your quality of life. You may not be able to do things you enjoy as easily as you’d like. You may encounter discrimination or bullying. Other issues may arise such as depression, disability, physical discomfort, sexual complications, shame and social isolation. If you or your doctor believes that you are at risk or are obese, then together you will take the proper steps to diagnose and treat your disease. Your doctor will perform a serious of tests including a general physical examination, BMI and weight circumference calculation, an assessment of your health history and blood tests to determine if you have any of the current risks associated with obesity. Effectively treating your obesity can lengthen and improve your overall quality of life. If you are struggling with your weight, talk to your doctor about the proper steps you can take to eliminate this dangerous disease.